For those who enjoy the company of fellow travelers and prefer to be guided by an experienced tour leader, we advise you to choose the fully-guided cycling concept. Accompanied by a skilled, professional and multi-lingual tour leader, you (and the rest of the group) visit interesting places and amazing highlights on the way. 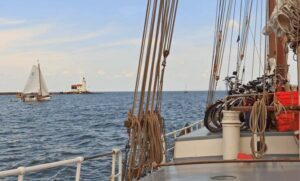 A fully-guided tour means that the group size for cycling is limited to 18 (for barges) or 22 people (larger ships). If there are more cyclists on board, a second tour leader will guide the other group. In this case, there will be a choice between two cycling options: a shorter/slower or longer/quicker tour (depending on the day-to-day program). 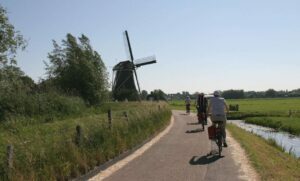 If you like, you can – on some fully-guided tours – decide to go on your own for a day, and cycle with the help of a detailed cycling map, written descriptions and the free app for your mobile phone “Ride With GPS” with Boat Bike Tours’ routes. The fully-guided tours in France are not really suitable to do on your own, because it can be quite difficult to find your way. For our Premium tours, the fully-guided cycling concept is the standard.